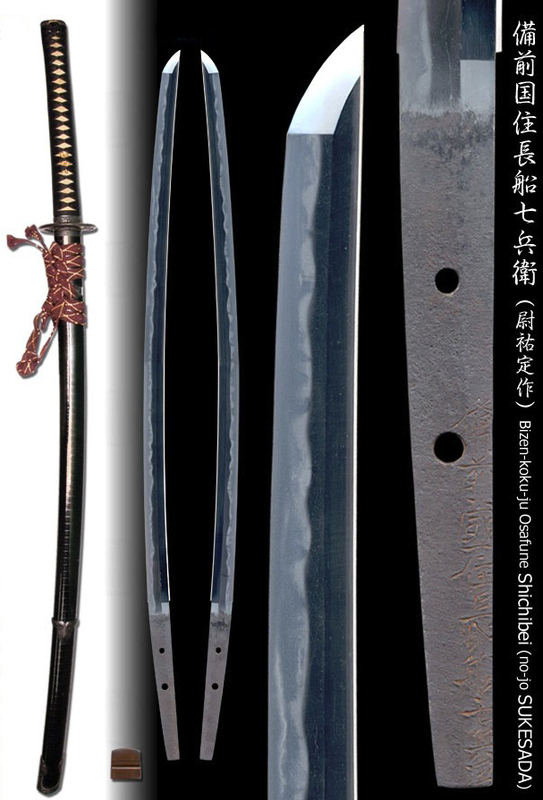 This elegant Katana comes with an NBTHK Hozon paper and Fujishiro Yoshio Certificate attesting to its authenticity and quality. Length of cutting edge 69.7cm Curvature 0.9cm Width of base 28.5mm Width of Yokote 20.4mm Thickness of base 7.2mm. Sugata(configuration) : Shinogi-zukuri, Iori-mune. Mihaba is in average and there is moderate curvature leading to a middle tip. Kitae(forging pattern) : Kitae-hada is fine kneaded Itame-hada (wooden grain) generally mixed with flowing Masame (straight grain) marks along shinogi-suji edge, where sparkling Ji-nie hard metal is covered over the surface that generates darkish, thick Nie lines or so called CHIKEI activity. Hamon (tempering pattern) : Hamon generally forms Gunome, mixture of composite clove outline, zigzag and some temper splash spilled on surface (Tobiyaki). Some of tall clove outline (choji-ha) almost reach to the shinogi-suji ridge. Temper outline is covered in deep Ko-nie glitter that forms streaming Sunagashi or Kinsen activity. The entire temper is vividly clear, full of bright Nie activity, gaily decorated. Boshi (tip): The temper of tip becomes straight line indication with medium circle turns back deeply. 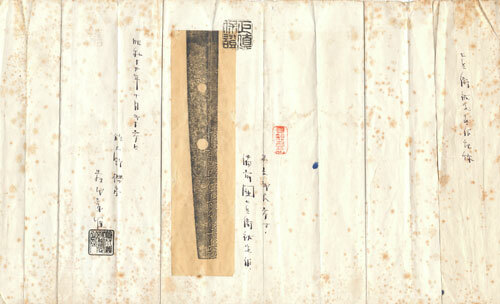 Nakago(tang) : Machi-okuri (shortened) about 5.5cm. Katte-Sagari slanting leftward file marks. There are two mekugi-ana retaining holes. The signature in front is located in shinogi-ji side, long character that starts from the place of work Bizen-koku-ju Osafune, real name Shichibei, the rest of heel is cut off, judged as SUKESADA. The smith Yokoyama Shichibei-no-jo SUKESADA is the first son of Yokoyama Toushiro SUKESADA who is a legitimate 5th generation of the frontier Yosou-zaemon-no-jo SUKESADA in Eisho era the beggining of 1500's in Muromachi period. He lived to 98 years old, passed away in the 10th day, 6th month, 2nd year of Enpo (1674). 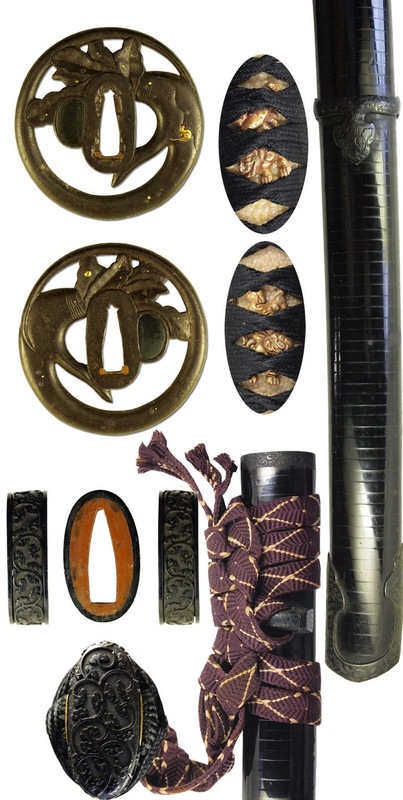 Unlike the other shinto katanas, he legitimately followed the traditional Osafune SUKESADA workmanship showing rich activity in the temper. 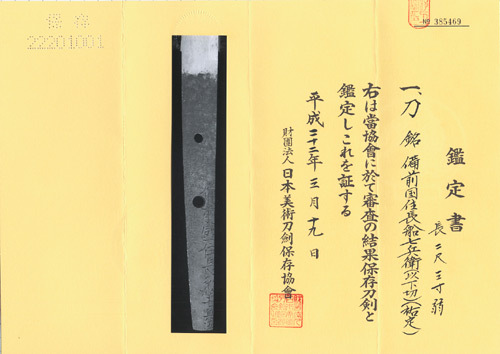 Old original copper Shonai style Habaki, Preserved in a Shira-saya plain wood mounting.